I don't often steal true news items from other blogs, figuring that they do a good job speaking for themselves -- Gavin Atkins' In the Boatshed blog in particular. But Gav has posted news so interesting that I feel compelled to make sure my readers see it, on the off chance that they don't subscribe to his blog (which they should). It's about the discovery in England of what is probably the world's oldest birchbark canoe -- an American Indian canoe from Canada, thought to be about 250 years old. Just south of the Bering Strait, in the Bering Sea, 100-mile-long St. Lawrence Island is midway between the Alaska mainland and Siberia. 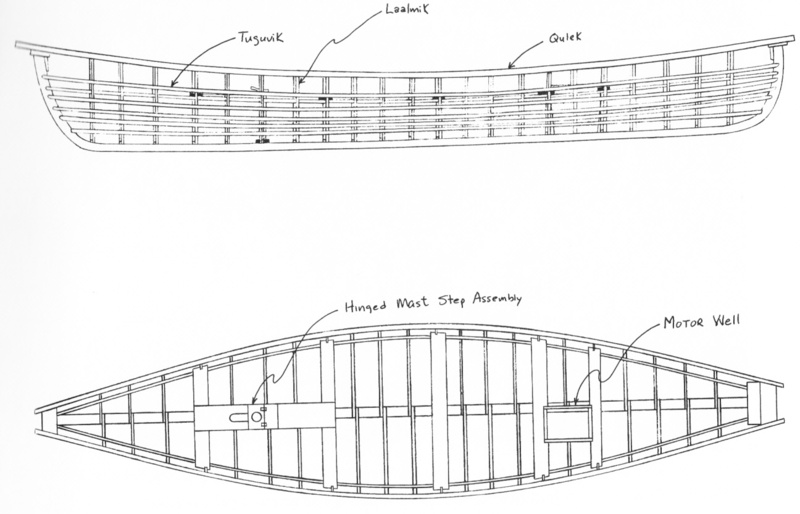 The open skin boats used there -- called angyapiks locally, and more commonly known by the more general term umiaks -- present an interesting story of nonlineal evolution. 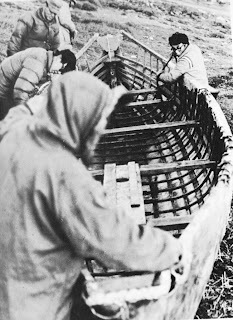 The earliest known type of skinboats here had flat bottoms, straight, slanted sides, and a hard chine. Although good descriptions were not made until the early 20th century, evidence seems to point to the existence of this boat type as early as the first Euro-American explorers, in the late 18th century. Frames were made entirely of driftwood, as there are literally no trees on St. Lawrence Island. 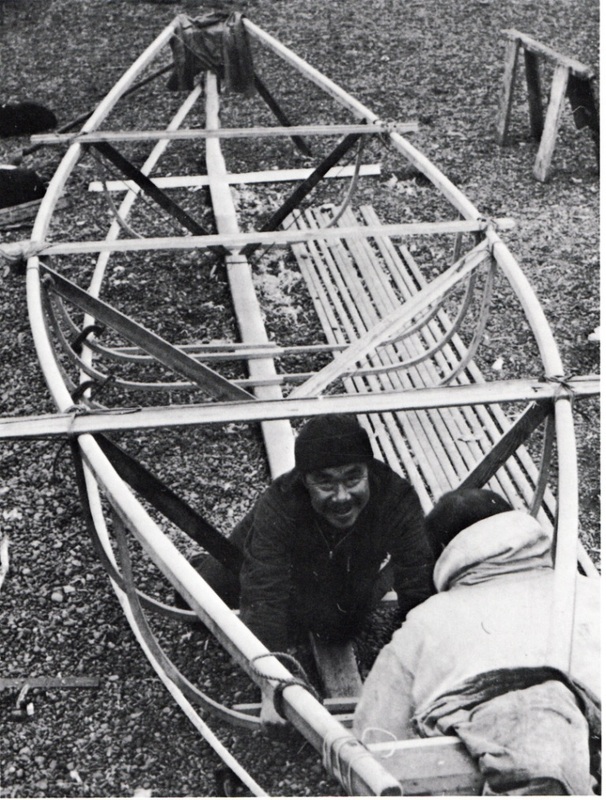 Frame members were tied together with baleen, and the frame was covered with walrus hide. Typically, two large walrus would cover the length of a boat, with pieces of a third used to bring the skin up to gunwales at the point of maximum beam. Note the keel, chines, risers, and the headboards that sit atop the stem and sternposts. Click any image to enlarge. Starting around 1860, whaleboats of New England design became available to the natives of St. Lawrence Island. At the end of a long whaling voyage, ships' captains would sell the islanders their worn-out whaleboats, or trade them for walrus that the islanders had captured. These, of course, were double-ended, round-bottomed, lapstrake boats firmly in Euro-American plank-on-frame tradition. 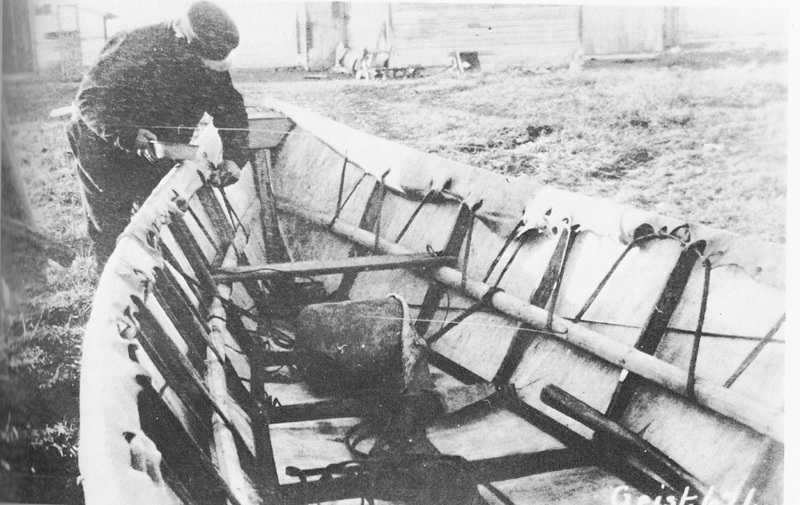 Although considered not quite so handy for local needs, the whaleboat nevertheless replaced many skinboats for whale-and walrus-hunting because of its perceived durability. But as the whaling industry petered out in the early 20th century, St. Lawrence Islanders had to find a replacement for the whaleboats as they wore out. Still without a local source of milled lumber, it was natural enough for the islanders to revert to the skinboat. But with their recent experience with the advantages of the round-hulled whaleboat fresh in their minds, the new angyapiks they began building were unlike the older flat-bottomed models. The new skinboats featured very round bilges -- perfectly round, in fact, because the frames were shaped by boiling them and then bending them around oil drums. The keel remained, but the chines disappeared, replaced by several stringers and a heavy gunwale. The floors remained quite flat. Although some were rigged for sail, it was more common for an outboard engine to be placed in a well. 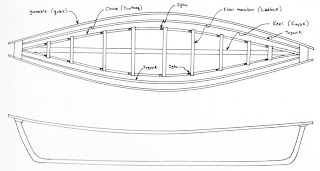 Gunwales are set up on diagonal braces against the keel and held at the proper width with temporary thwarts. The first ribs have been installed, pre-bent by boiling then shaping against an oil barrel. Lacing the skin onto the frame. Note the mast partner and the headboards at the top of the stem and sternpost. A completed round-bottom angyapik frame. 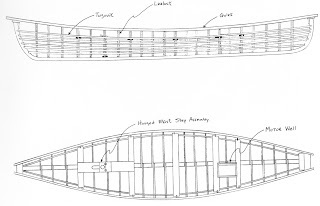 Profile and plan of a round-bottom angyapik. In addition to some of the well-known advantages of seaworthiness of a round versus a flat hull, the new design was easier to handle on land and over ice -- important considerations, as the boats were beached daily, and often had to be manhandled long distances over ice to reach open water. On the earlier, flat hull, the walrus skin passed over the bottom of the keel. 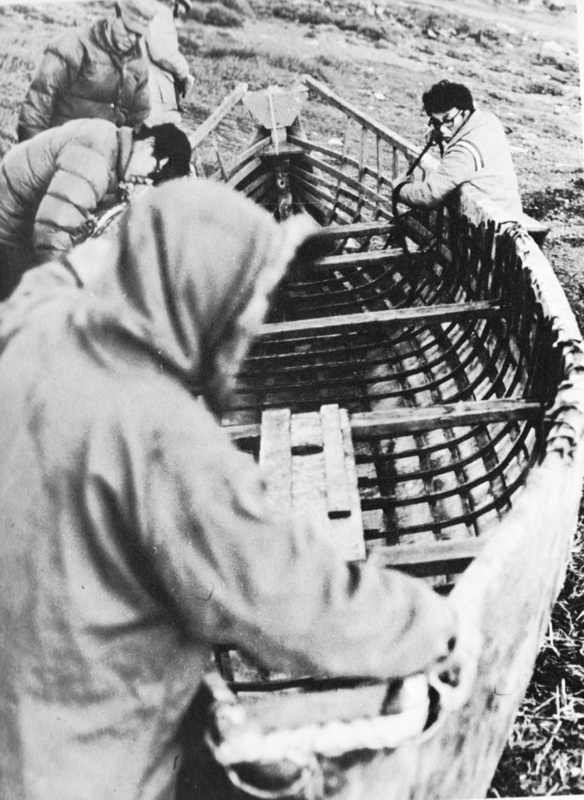 To drag the boat on its own bottom would very quickly wear through the skin, so instead, the boat was placed on a small sled with bone runners whenever it had to be hauled over land or ice. 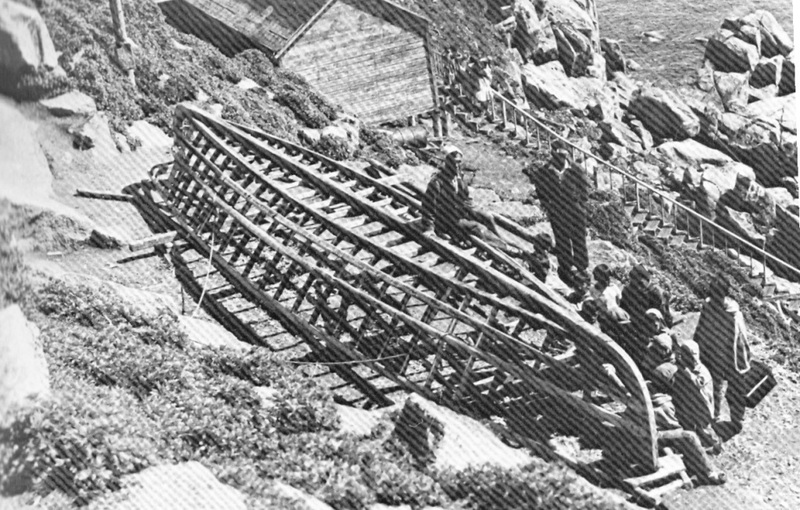 Sled (top) for transporting a flat-bottomed angyapik over land or ice. 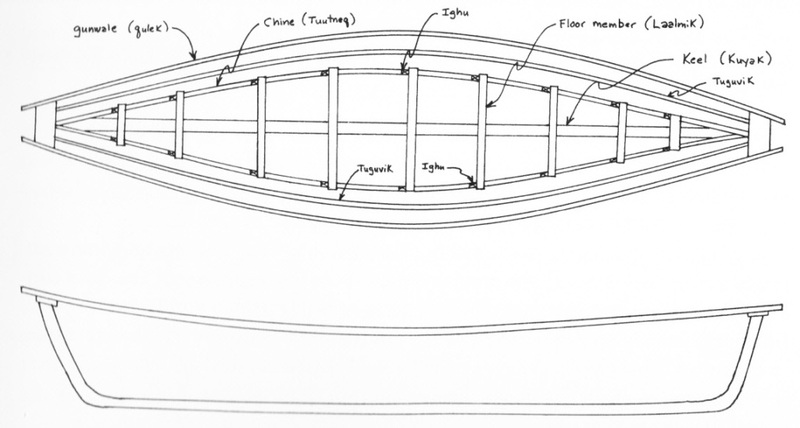 The new, round-bottomed version simplified this process by sandwiching the skin between the keel and a false keel, and then nailing a bone shoe to the bottom of the false keel. The boat thus gained a built-in sled. Left: early, flat-bottom angyapik. Right: more recent, round-bottom version. 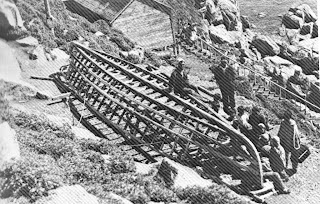 Further north in the Bering Sea, on King Island, the flat-bottom skinboat remained in use later. As the last photo shows, this was very similar to the St. Lawrence design, but significantly larger. All photos and input from The Skin Boats of Saint Lawrence Island, Alaska , by Stephen R. Braund.